Many coloured sails on the beach and on the water, a sea bridge admirably decorated with flags, live presentation of all races at the bridgehead, the whole city booked-up with tourists and two stages for the musical evening program. 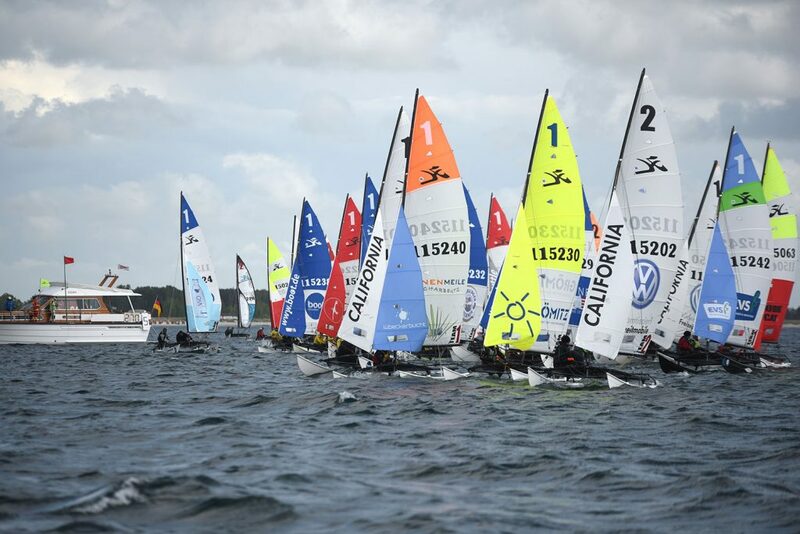 All together 23 races were sailed on two race areas in three classes. The numerically smallest class, the Hobie 14, but always an important part of the Super Sail Tour, had with Markus Merten an outstanding winner. Who can claim to have a first place as a discard in the list. He won all eight races before Erik Schwettscher. The fast Hobie 16, dominated once again by the “old”. On the first day in offshore winds, violent gusts and wind shifts they played from their experience. 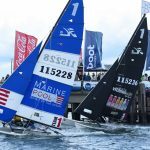 On Sunday they only went out for two races before the sailors were sent ashore for safety reasons by the race officer Hans-Herbert Hoffmann. On the way to the beach, the fleet caught then in a hailstorm, which it had in itself. Since the weather conditions on Sunday remained uncertain, the organizers decided to start no further races. On Monday promised the inter results still a lot of thrill. The tip was closely together and the wind increased steadily. Many capsizes made the visitors on the bridgehead clear that sailing is a real sport. 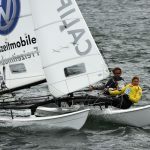 At the end Detlef Mohr won with his longtime crew Karen Wichardt in front of Ingo Delius and Sabine Delius-Wenig. “We are happy every year about the colourful picture of the catamarans . The sailors are with pleasure seen guests in Grömitz. 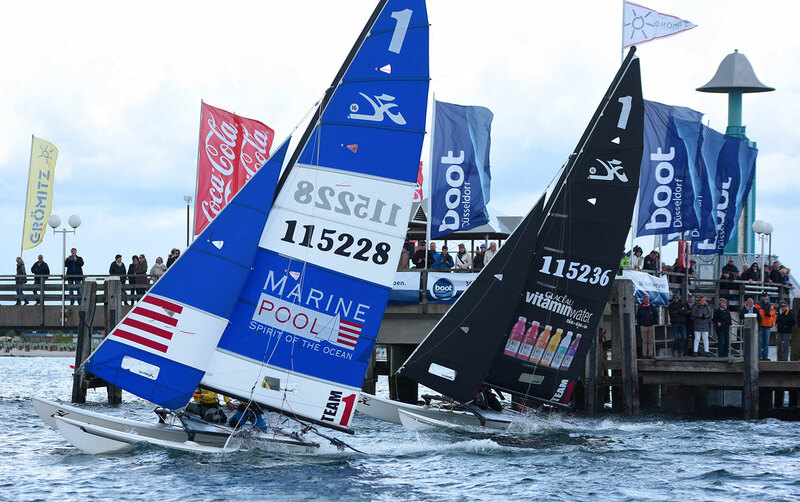 Exciting regattas on the water, good mood everywhere and hence we decided to extend the contract with the Prosail Sail events for another three years,” said Olaf Dose-Miekley Marketing Manager of the tourism service Grömitz. The organizers of the tour, Willy Trautmann and Detlef Mohr, were happy about the contract extension. „To know that our season opening will be in Grömitz in the next three years is an amount of planning security gives us. Without partners like Grömitz, our many sponsors, but also without our great team, the tour would be not at all practicable in her current form,“ thus Willy Trautmann. The evening program with great musical tidbits put the heating on the visitors and animated to sing and dance. Short term the tasty cocktails at the bar were extended by the classically north German Grog. 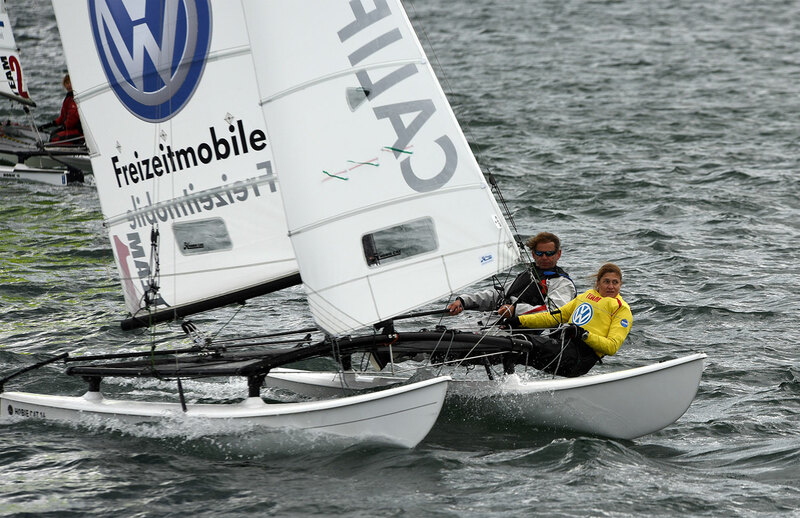 The next stop of the Super Sail Tour is Scharbeutz from the 8th to the 10th July, 2016.